I'm interested in looking at the past and interpreting vintage designs to fit contemporary style. Many of my personal projects reflect this curiosity through the source of the pattern or inspiration. I also look at how knitting and the fiber arts can influence public knowledge about social issues such as HIV/AIDS or breast cancer, and how the craft has the power to unite, empower, and heal. This page shows some of my work; each piece teaching me more about the craft, my abilities, and reminding me that finished objects are often less important than the journey. 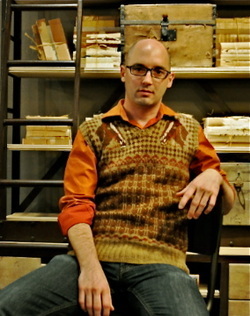 Knit using a vintage pattern (1959), the seahorse cardigan was an exciting adventure into the world of color work. The bottom button is vintage and also features a seahorse. As part of a knit-a-long, I made a pair of knitted boxers using the Socks Appeal Boxers pattern from Skacel. These were used for "show and tell" at the Men's Spring Knitting Retreat at Easton Mountain, NY, May, 2010. My friends John and Chuck went "above and beyond" and also knit coordinating socks! A collaborative project with Los Angeles Based artist Lisa Anne Auerbach. She offered a workshop to learn how to design and make a sweater in her style. Mine is based on the idea that once a cure exists (to disease, famine, whatever), it's easy to forget what it was like during the struggle. I made this sweater in honor of those I know who have fought battles, hoping that it would remind us that one day we'll find the cure and the battle will be over. Approx. 72" x 64" blanket created for an online friend battling cancer in Holland. 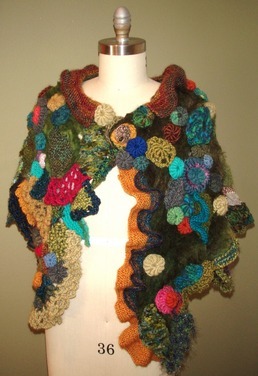 Collaboration with knitters and crocheters around the globe. 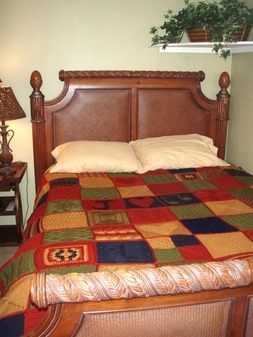 Described in THIS post on my blog, the blanket was a true labor of love. Each 8" x 8" square was attached to its neighbors using three needle bind off, and a beautiful crochet border was added by Doug Laughlin of Los Angeles, CA, and Ivar Asplund from Sweeden. Completed: July 12, 2009 - Began July, 2008 after a class in freeform knitting & crochet, the recent months have driven me to finish this work. The button on the wrap is a converted button from Edgar Berebi, and the base of the piece is a felted fleece from Ozark Handspun. More can be read on the blog post announcing the completion of this work HERE. Completed in 13 days (August 16-29, 2009) - using a basic top-down raglan knitting pattern and adding a technique of alternating 2 yarns every 2 rows, I created this sweater using 12 different skeins of Noro Kureyon wool yarn. Exploiting the subtle color changes, I was careful to try to blend the end of one skein with the beginning of another. There's no way to know what a sweater like this will look like until it's knitted - the color of the yarns all change constantly and randomly which made this project exciting to knit!